The Chinese language uses two symbols or letters when speaking of “crisis.” The first symbol represents danger and the second symbol represents opportunity. This image is a perfect representation of what we are promoting here in the Diocese of Syracuse as we look towards the future. This is a time of great opportunity! It is a time in our diocesan history when we have the chance to be innovative and to push the outer limits of our imaginations so as to reinvent the Catholic schools entrusted to our care. From crisis comes opportunity, and from opportunity comes growth. 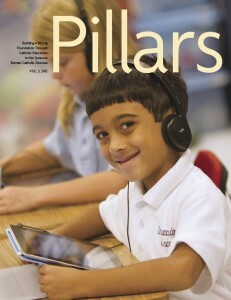 This edition of Pillars magazine serves as a reminder to everyone that Catholic education is alive and well here in Central New York. For 125 years, this diocese has served the Catholic faithful of this region, and Catholic schools have been an integral part of that story. Our teachers, administrators, alumni, benefactors and dedicated religious have made certain our schools remain a vital part of our story. Moreover, they are counting on us to preserve this treasured asset and to be good stewards of the traditions that they have passed on to us. In our 22 schools across the diocese, we are doing just that, and the results are astounding. will be proud of the accomplishments we have made in our schools and that this pride will propel us into a future filled with promise. This is a time of opportunity for Catholic schools, not a time of danger. May our prayer be that God’s grace continues to guide us in building up this precious tradition.